The throne room was the most lavish place Eunji had ever seen. Crafted out of expensive stone, every surface was painstakingly hand-carved and accented with gold, silver, and precious gems. A few scattered windows let in misty daylight, while lanterns filled in dark corners with a subdued glow. Altogether it seemed a grim room, where no thought was given to happiness or comfort. Altador is a place of many, many wonderful things. See some fantastic architecture, browse some long-buried ancient knowledge, sample some fine foods...you simply haven't lived until you've experienced your chef fry up an Altadorian cheese platter for you at your table! The inside of the cheese gets delightfully warm and melted, and don't get me started on the hummus. Mm-mm. Of course, at this time of year, Altadorians only have one thing on their mind...that is, the Altador cup. It's an event centered around competition, honor, glory...and of course, the fantastically rare Petpet known as the Yooyu. And you now have a chance to participate in this incredible tournament of valor and skill! But where do you start? And how do you get the most out of it? Well, grab a handful of pita chips and listen up, friends. We’ve all read countless press releases, interviews, and news blurbs about the ongoing Altador Cup, and it is hard not to get swept up in all the excitement! But I am here to provide you with the perspective and opinions that no one else has sought after: the Yooyus themselves. 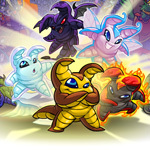 Here with me are Alfie, a Darigan Yooyu, and Genevieve, a fire Yooyu. I’m going to dig down deep and get to the heart of Yooyuball itself: the Yooyus. NT: Good morning guys! How are you? Alfie: Good morning. A bit sore, honestly. We train all year for this, and you think you’re prepared, but once it starts you realize just how grueling it is! Ouch. Sorry to hear that. So tell me more about this training. I’ve never heard of it. Alfie: Well, just like the team players, we have to be ready to bring our A games when the cup rolls around. Summer Vacation: Mystery Island Edition! Summer Vacation: Mystery Island Edition! Summertime is in full swing in Neopia! Neopians are out and about in Neopia enjoying the warmer weather before Autumn comes again. Many Neopians like to venture to Mystery Island to take in the warm weather. They enjoy the white sands, clear water, the scenery, and the exquisite tropical foods only found on Mystery Island! This article is for Neopians who are planning on taking a trip to Mystery Island this summer. This week, we are showcasing ten items you should take with you to help make your trip more enjoyable! A young female human who goes by the nickname of Kilala makes her way down the beautifully paved streets of Shenkuu while holding a small bag full of gifts in her hand. She had been exploring all around Neopia today and stopped at various shops to buy items for her Neopets. While walking down the street she gazes around with a look of admiration and appreciation swirling in her warm chocolate brown eyes. The landscape, the natives, and the food belonging to Shenkuu are uniquely exotic and different than other parts of Neopia; it is simply this reason why Shenkuu has become Kilala’s favorite city to visit. Whenever she’s given the opportunity to see Shenkuu, she is usually seen with her hyperactive and curious Spotted Lupe, Oemu. The two of them, when together, enjoy visiting Exotic Foods and bonding over a bowl of miso soup or Soba noodles. However, today Kilala is spending some quality time with her Faerie Xweetok Kirara and Kirara’s Petpet GinSakura. They started their day making breakfast together and bouncing ideas in regards to how they would spend the day together. 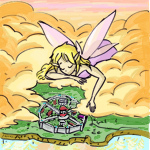 After completing their dailies and earning a good amount of neopoints from playing various amounts of games, they started their journey in Neopia Central and began traveling from there. From The Lost Desert to Roo Island and now Shenkuu; the day has been wonderfully filled with fun and excitement. "I've called this meeting today because of…well." A cough. "You know. You've all seen the numbers." Vonde Cayle, left forward of the Lost Desert Altador Cup team, flicked his enormous Wocky tail in a gesture everyone knew meant "a record-breaking sandstorm of words is coming and you all are about to get a face full of it." Everything felt heavy today: his gear, the squiggly-lined heat coming in through the practice room window, and most of all, his ever-faltering hope in his team. "Since when do you call meetings?" asked Rhee, in the process of tugging her gloves off. "Where's Leera?" "Leera is in the Alone-Time Corner, weeping for our lost dignity." "Oh, come on," countered Derbi with a shake of her scarlet wings. Usually she acted as Vonde's right-hand man—literally, she played on his right-hand side—but today her indignant team spirit seemed to trump her loyalty. "We lose every other day, every other year. When was the last time we got anywhere near the podium?" "Altador Cup X, fourth place," muttered the team in four-part harmonization. A pause. A long, sad little pause. "Well, after all this time, I’ve finally realized what our mistake has been," Vonde told them. "Not enough slushies slung?" asked Rhee, right defender. "Not enough noise made?" tried Derbi. "Not enough…" Luvea, left defender, frowned. "Shootouts showed down?" Thank you Kitty for letting me use you and Tytono in my little story :)! And thanks to my neopets as well! Yooyu + Ball = ??? We’ve all read countless press releases, interviews, and news blurbs about the ongoing Altador Cup, and it is hard not to get swept up in all the excitement! But I am here to provide you with the perspective and opinions that no one else has sought after: the yooyus themselves.